WHEN men in olden times attacked a city, they tried to batter down the walls with heavy beams of wood, having heads of iron, called battering rams; but God did not instruct the Israelites to capture Jericho in that manner. They were to remember that it was not by their own power they could conquer the Canaanites, but only as God gave them the victory over their enemies. So God commanded Joshua to lay siege to Jericho in a very strange way. He said that seven priests, each having a trumpet, were to go before the ark. In front of them the armed men of Israel were to march; and behind the ark the people were to follow. 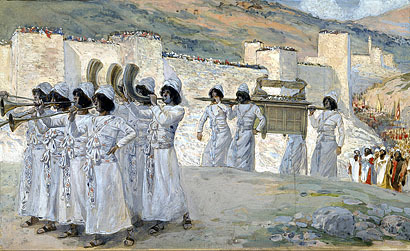 In this way they were to march around the city once each day for six days, the priests blowing their trumpets each time. The seventh day they were to go in the same manner around the city seven times; and God said that when the priests blew their trumpets the seventh time, the people were to give a great shout, and the walls of the city would fall down. Joshua and the people did as God commanded. They marched around the city carrying the ark, the priests blowing their trumpets; and on the seventh day they marched around seven times. The last time, when the priests blew their trumpets, the people shouted with a great shout, and the walls of the city fell down flat. 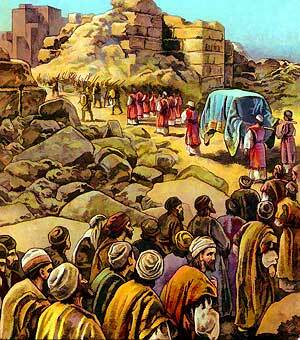 Then the Israelites went up and took possession of it. Thus God delivered Jericho into the hands of His people. All the inhabitants were killed except Rahab and her relatives. These were spared because Rahab had been kind to the spies whom Joshua had sent.